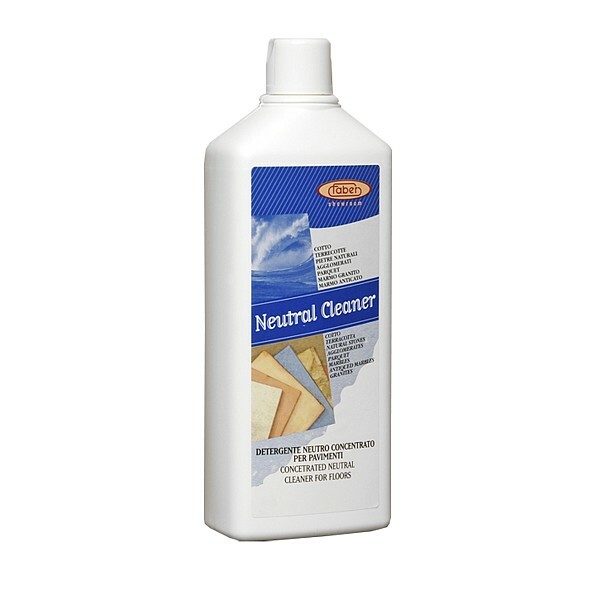 NEUTRAL CLEANER is a water-based pH-neutral cleaner with a concentrated formula, specifically formulated and developed for daily cleaning and routine maintenance of all floors and general surfaces covered with natural materials such as cotto, terracotta, marble, natural stone, and agglomerates. NEUTRAL CLEANER is a product that contains no wax or other agents that would otherwise leave a patina or residues and which, with time would cause problems of opaqueness and trap dirt on treated surfaces. On the contrary, NEUTRAL CLEANER is a product that leaves no residues, guaranteeing a high level of surface cleaning, leaving a fresh, pleasant clean fragrance, while nourishing the treated material and boosting its resistance to dirt from foot traffic. When used at the right concentration, NEUTRAL CLEANER needs no rinsing.